May this dream come true for Lanka! Has Mahinda lost control of the stock market? Rag: Get into campus life! Vidyaloka Vidyalaya in Galle, that was closed earlier this week following unruly behaviour reportedly by students and parents will open tomorrow, while police continue their investigations into the incident. 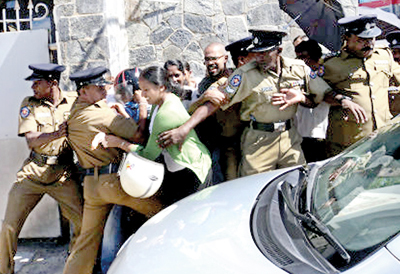 Galle’s Senior Superintendent of police (SSP) Vas Gunawardena told the Sunday Times, that security has been tightened at the school to pre-empt a repeat of the unprecedented incidents that took place on Monday (October 1). The school has 2300 students on roll and a staff of 102 teachers.A tense incident arose when students and parents reportedly pelted stones and bags full of urine at the newly-appointed principal, Bandula Jayasinghe, who arrived at the school to assume duties. He had delayed assuming his duties by three months, due to opposition to his appointment the Sunday Times learns. 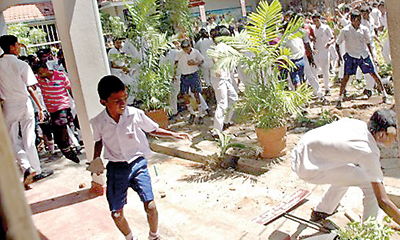 As Mr. Jayasinghe arrived to take over duties some parents who were opposed to the transfer of the previous principal had reportedly blocked the entrance of the school but had dispersed after being warned by the police.�The pandemonium began while Mr. Jayasinghe was participating in religious observances before assuming duties when a group of students outside the building started hooting and shouting. Soon a clash erupted and students were seen hurling bricks, rocks, bags of urine and other objects. A crowd that had gathered stormed the gate and joined the students. A teacher who had accompanied the new principal from his former school, Rathgama Devapathiraja Vidyalaya in Galle sustained serious injuries and had to be taken to Karapitiya Teaching Hospital along with eight other injured students. Following the incident Southern Province Education Director, Kithsiri Liyanagamage and SSP Vas Gunawardena decided to close the school for a week.As police began a probe, the students who were undergoing treatment had reportedly fled hospital in fear of being arrested by the police after media stations aired footages of the incident. “The police are investigating the matter. We were able to recover granite, bricks, clubs, a slipper and a metal ball from the school grounds, which we suspect were brought by some people into the school. After obtaining a court order by the Galle Magistrate, U. S Kalansooriya, the police were able to obtain the video tapes from media stations which clearly show how the incident took place and who are involved in it,” SSP Gunawardena said, adding that the police have recorded statements from teachers and students of the school. He said they also obtained a court order to get details from a phone company to track down an anonymous caller who had threatened the new principal.�The Sunday Times learns that the former acting rpincipal F. Welage had been appointed as acting principal by the Public Service Commission (PSC). “Mr. Welege improved the quality of our school within a few months. Last year applications for grade one was only 500 or 550 but this year there were 975. At the scholarship exam last year only 17 students got through, but this year there were 26 who passed well. A principal can’t do much for a school during a few months,” he said adding that many politicians including the Deputy Speaker Chandima Weerakkody assured them that Mr. Welege wouldn’t be transferred when the OBA and the parents handed a petition to them. Meanwhile Mr. Welage told the Sunday Times he was appointed in an acting capacity in September 2010. He said however in June this year another principal was appointed without considering his service. He said on September 27 he received a fax message from the Education Ministry Secretary, Gotabaya Jayaratne, instructing that he handover the post to the new principal immediately and the following day he did so. “The commission can’t violate the rights of an individual. If the person is qualified for a job he applied for even if it is for a month we will give him the job. The former principal wasn’t qualified enough for the post,” a PSC official told the Sunday Times. Mr. Jayaratne, had reportedly sent a letter of suspension to Mr. Welege for disrupting the newly-appointed principal from taking over his duties and not reporting to the PSC as he was told to. But Mr. Welage says he reported to the PSC and he was at the commission at the time the clash occurred. Meanwhile the new principal Mr. Jayasinghe said he did not have the least suspicion that the parents and students were opposed to him taking over . “I have been working in the education sector for 41 years and for 14 years as a principal in National Schools. I haven’t heard of or seen children behaving this way in in front of police and teachers. I am disappointed in the way these students have been taught. There are 102 teachers in the school and only a few male teachers tried to control them while the others did nothing,” he said. 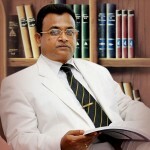 Meanwhile Southern Province Educational Minister, Chandima Rasaputhra said there was no encouragement on their part to replace the principal with someone outside the school. “We always hand the post over to a teacher or deputy director who is next in line because this way we can avoid clashes. However, Vidyaloka Vidyalaya is a National School,” he said adding that the incidents that took place were inexcusable. “Children go to school to learn. If the parents and the teachers take the law into their hands and behave in an unruly way in front of minors they tend to imitate the exact thing. Elders shouldn’t give wrong messages to children,” he said. When the Sunday Times spoke to some parents they said they suspected that a teacher who had served in the school for a long period was behind it. Devika Mudalige a parent of a Vidyaloka student said that they saw the rugby team attacking the students and now the blame has fallen on the students and the principal. “Mr. Welage was a good principal. Children loved him. When he came to Vidyaloka it was not in a good state but within a few months he was able to develop the school. He donated shoes to children whose parents couldn’t afford to buy them,” she said. “The blame has fallen on the children. It has brought a bad name to the school. I believe that this was done by some teachers. They should be transferred every few years, because when they serve in a particular school for more than 20 years they become possessive of the school and make their own rules,” another parent. Following the incident at Vidyaloka Vidyalaya the Sunday Times spoke to a few former principals and a psychiatrist to get their views. Former principal of Mahinda College, Galle, R. M. Werahera �“From this incident we see that the Public Service Commission and the whole education sector of the country have collapsed. We clearly see that there is some external force that has provoked the children to reject the new principal. The children have been misled by someone. 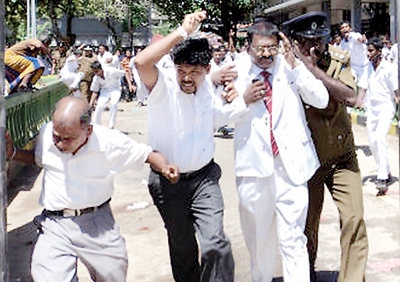 “In June this year we witnessed a similar incident at Mahinda College. However, the teachers were able to control the students but in Vidyaloka Vidyalaya the teachers failed. The most disappointing part is that the children acted this way right in front of the police station,” he said. Former principal of Sumana Balika Maha Vidyalaya, Ratnapura, W. I. Jayantha “Elders should set an example for the children. Now this incident has become a bad example to other students in the country too. They will think that this is the best way to solve problems. “We should teach our children that no matter what they do in the end they’ll have to face the consequences as individuals. At present we see that the students lack patience and other good qualities. We have to hold workshops to show them how important these qualities are,” she said. Former principal of D. S. Senanayaka Madya Maha Vidyalaya, Ampara, R. G. Kulathunga “In this particular incident children were given about three months to prepare themselves before the new principal took duties. This was enough time for external forces to manipulate the children. The incident could have been avoided if within two weeks of his appointment the principal had assumed duties. “Also education is discipline. We clearly see that the Education Sector of this country has failed when it comes to that. We have to discipline students to make them obedient and follow the right path in life,” he said. “Students are children who are learning. Be it in school or university they always learn. If we teach them wrong they do wrong. So adults should be cautious because they are role models to these children. “Today we see that there are forces that manipulate others. Some blindly follow them. This is what happened in this particular incident too,” he said. Badulla District Zonal Education Director, W. K. J. Piyarathne �“We can’t just isolate the students and find fault with their behaviour. The whole society is to be blamed. When society is corrupt it is reflected in the behaviour of students. “Not just Sri Lanka if we look at the international scene too we see these unfair, biased and corrupt incidents taking place. Now what we see are the result of all these and it’s more like a social erosion. The Vidyaloka incident is just one incident of this,” he said. Dr. Harischandra Gambheera, Psychiatrist at the National Hospital of Mental Health �“This kind of behaviour is what we call as a mob activity. Here individuals work as a group without any rational thinking. “In this situation children behaved irrationally not like intelligent human beings. It’s hard to avoid these situations because to avoid it one will have to physically remove the stimulating groups,” he said. Health Minister hits out at Legal Draftsman’s Dept. T-20 semi-finals, final ticket prices go sky high like sixes! 6 to 7 die daily on our roads, what are we doing to stop this?